We are a leading Manufacturer of super 70 briquetting press, super 70 briquetting machine, super 70 briquetting plant and super 70 briquetting press machine from Rajkot, India. As our latest technological Super 70 briquetting machine is able to make briquettes with minimum time and labor efforts, this machine becomes the prime requirement of the medium level industries.we assure our clients by supplying quality machine. Radhe Group Rajkot- The newest technological Super 70 Briquetting Machine is the new invention of the Radhe Group Rajkot is particularly designed for the industries that required medium level production of the briquettes. The Super 70 Briquetting Machine is used to manufacture the briquettes of 70 mm diameter by only power requirements of 49 HP. 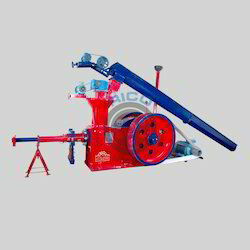 Super 70 Briquetting Press Machine accepts the raw materials up to 12 mm directly without grinding and manufactures high quality briquettes continuously without need of constant supervision. The Super 70 Briquetting Press uses the latest binder less technology for manufacturing briquettes. This briquetting press is specially designed for those industries where medium level production is required and where medium level of raw materials is available. The advanced technology is used in the super 70 briquetting press that saves the cost supervision. Radhe Group Rajkot provides the Super 70 Briquetting Plant that is used for the recycling of the agro-crop waste with minimum cost and labor efforts. The finished product of the Super 70 Briquette Plant is containing the 70 mm diameter. The Super 70 Briquetting Plant is able to make high solidity briquettes from loose biomass without causing harm to our environment. 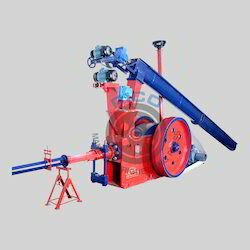 Radhe Group Rajkot - Super 70 Briquetting press machine accepts the raw materials up to 12 mm directly without grinding and manufactures high quality briquettes continuously without need of constant supervision.